An essential item in every camper’s gear collection is a tent. A tent provides shelter from the weather and a safe place to sleep in at night. Tents are a portable home away from home, which provides you with comfort and safety. However, not all tents are made equal. If you are a backpacker, having a lightweight tent is extremely important. When it comes to carrying your gear, you can cut down on size by investing in a high-quality backpacking tent. A backpacking tent is an excellent design choice for a compact tent that doesn’t skimp on durability. While the weight and size of a tent can be extremely important because you have limited space in your pack, it doesn’t mean you should sacrifice quality. A backpacking tent still needs to be durable enough to withstand all weather conditions. 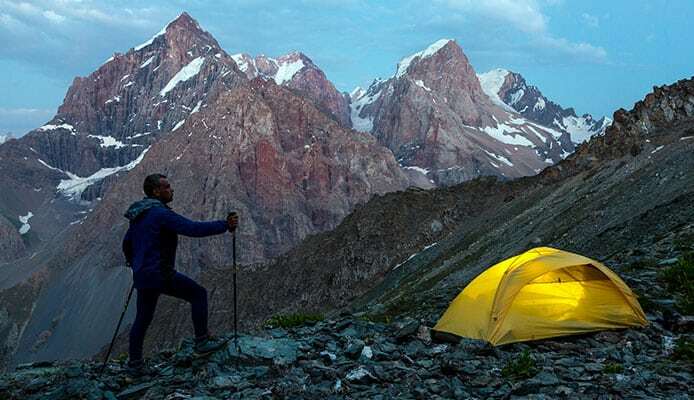 This guide will help you choose which backpacking tent design best suits your needs. A backpacking tent is a great choice for the outdoor explorer’s who need every inch of space their pack delivers. Backpacking tents are strong and durable but save you precious weight and space. Their compact design ensures that you will have a shelter, but you won’t break your back trying to carry it with you. Experience nature with our list of the 10 Best Backpacking Tents in 2018! 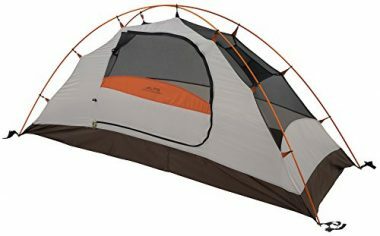 This Salida Camping and Backpacking Tent by Kelty is a two-person backpacking tent that is backpack friendly. This tent is a 3-season tent with a free-standing design. The tent comes with compact folding poles, gearloft tops, and a color-coded clip and fly attachment. The seams are fully taped to help keep out the weather. 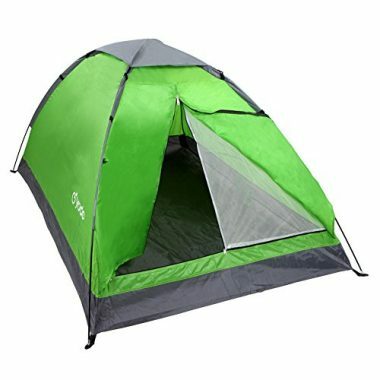 The tent is made of 68D Polyester which also features 40D No-See-Um mesh on the windows and door. The windows can be unzipped to allow for ventilation, which keeps you dry and cool inside the tent. There is one large D-shaped door for easy access in and out. The floor is made of 68D Nylon that is waterproof coated to 1800mm. The tent is easily constructed and features a two-pole system. The tent is a double wall design and the rainfly can be easily attached to the outside for protection from the rain. The tent is quick and easy to set-up thanks to the color-coded system. You can easily fit two people and their gear inside, once the tent is constructed. 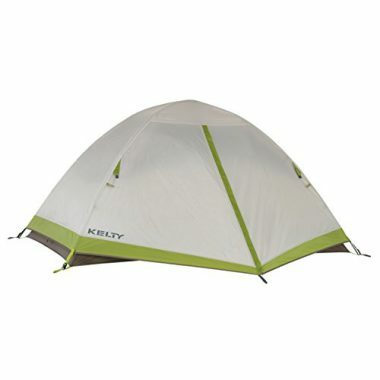 Kelty’s design has backpacking tent reviews that call it “Award Winning” and so lightweight that “you will almost forget it’s in your pack”. With Kelty’s design and the Salida Camping and Backpacking Tent, you can lighten up and enjoy all the backcountry views. If you are wanting to take a solo backpacking trip, this Lynx 1-Person Tent by ALPS Mountaineering is an excellent choice for a single person tent design. This lightweight backpacking tent features a no assembly frustration guarantee. You can easily set-up this tent alone without having to struggle. The tent is a freestanding tent that uses two aluminum poles to support the structure. Due to the minimal poles, it is a breeze to set-up this tent. This backpack tent has a double wall design. The first layer is mostly mesh and a second layer, the rainfly, can be easily added to the outside. The fly is made of 75D 185T Polyester which resists UV damage. There are factory sealed seams from the rainfly to the floor to ensure no water leaks inside. The floor is also waterproof and features a 75D 185T Poly Taffeta floor that has a 2000mm waterproof coating. The zippers are durable and extra-large. The rainfly also incorporates a vestibule in the rainfly for the door. The tent also features storage pockets, a gear loft, and guy ropes. The poles are made of durable 7000 series aluminum, which means they are also lightweight. With ALPS Mountaineering design you can easily and confidently take a solo trip to the great outdoors. This Lightweight 2 Person Backpacking Tent by Yodo is a single wall tent design that is lightweight and features an easy set-up. The tent is ventilated on the roof near the rainfly to allow for inside airflow. There are two fiberglass poles and four metal stakes to support and hold this tent. There is one main door with a two-way zippered mesh window. The mesh window and sides deliver more ventilation, while still keeping bugs and critters out. The zippers are two way to ensure that you can easily enter and exit. The tent is made of 190T Polyester and comes with an Oxford PU coated groundsheet as well. The entire tent from the groundsheet to the body, can be easily set-up and taken down by a single person in 5 minutes. When you aren’t using the tent, it can be easily stored and folded away into the provided carrying case. Yodo wants you satisfied, so they offer a 180-day money-back satisfaction guarantee. With this lightweight backpacking tent by Yodo, you can be sure to get the protection you need while out on the trails. You can save space with this compact design and travel with ease. This 2 Person Portable Backpacking Tent by TNH Outdoors is a lightweight backpacking tent that is made out of waterproof and durable material. The material is also environmentally friendly for an added bonus. The tent is spacious and convenient. The tent can be used in all four seasons for all occasions. There are ventilation windows to allow you to catch a breeze. There is a single aluminum pole to support this structure. The tent has a double wall design. The rainfly has a vestibule built-in to its design, which gives you more storage space. 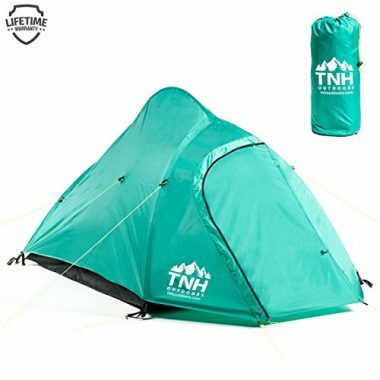 This 2 person tent for backpacking is guaranteed to have the best value by TNH Outdoors. They want their customers satisfied and if not, they will happily fix it. Whether you are going to an outdoor concert, travelling, or just sleeping in your own backyard, this tent is an excellent compact design. 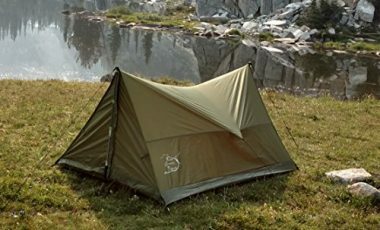 This 2 Person Trekking Backpacking Tent by River Country Products has an A-frame design that is super-fast and easy to set-up. 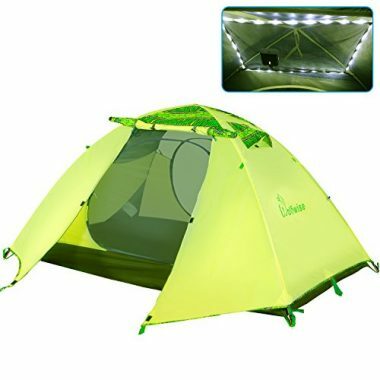 This tent can be used solo or in a pair. However, it may not fit all your gear if you sleep two people. The tent is meant to be stabilized by your trekking poles, which means there are no separate tent pole purchases. Unless you don’t have trekking poles, you can use the ones you have to create the tent’s structure. The best trekking poles will get to at least 42 inches tall. If you don’t have poles, the tent can also be pitched between two trees. The tent is over 7 feet long and 5 feet wide, which provides plenty of living space. This is a lightweight backpacking tent can be easily compacted down and packed into your backpack. The tent includes 8 aluminum metal stakes. The tent should also be supported by guylines to give it added support in the wind. The tent has an easy set-up that can be completed in under one minute. There is a two-layer door. The outer later gives protection from the elements and the inner mesh layer allows for airflow, but protection from critters and insects. With River Country Products design, you can be on the road faster and feel secure that you have an easy to use and durable tent design. This Single Person Backpacking Tent by Winterial is an ultralight backpacking tent that has an easy assembly. The tent is constructed and supported by two hoops. It is a 3-season bevy tent that you can easily take on any trip. The roof is ventilated with mesh and has a fully coverage rain fly for the cold and wet weather. There is a large zipper door for easy access. There are 14 heavy-duty stakes included, as well as three bundles of rope to keep the tent securely fastened to the ground. This tent is lightweight and can be easily carried by a single person. With Winterial’s design, you can be hiking the trails confidently. This Hubba Bubba 2 Person Lightweight Backpacking Tent by MSR is made of lightweight 20-denier ripstop nylon and 15-denier nylon mesh. 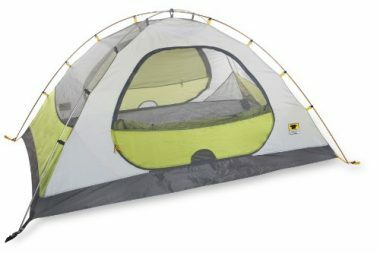 This is a 3-season tent that can easily fit 2 people and their gear. This tent design by MSR features a unique pole geometry that provides 29 square feet of floor space. The tent has mesh windows that allow for easy ventilation and breathability. The set-up is minimal and features a footprint, poles, and rainfly. The tent has two doors and a mixture of solid panels and windows. The solid panels provide warmth and privacy. You can roll up the rainfly if you would like to take a peek at the stars. MSR wants their customer’s satisfied so this lightweight backpacking tent comes with the manufacturer’s 2-year limited warranty. This Morrison 2 Person 3 Season Tent by Mountainsmith features 35 square feet of interior space, which can comfortably accommodate 2 adults. There are two doors and two vestibules. The tent is freestanding and uses an easy clip-pole attachment. There are reflective guylines with tension lock and cord adjustment. The guylines also have a tri-glide feature to ensure they are easy to use. There are ventilation windows in the tent fly and a removable gear loft. The tent features a bathtub floor construction with taped seams, to ensure it doesn’t flood. 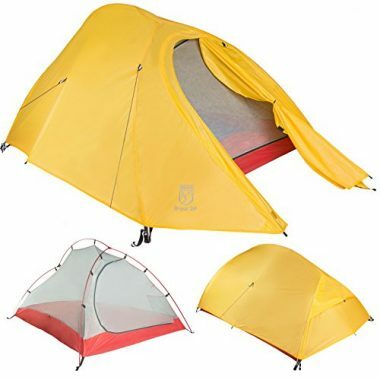 The tent is made of polyester, which is waterproof and durable. There are set-up instructions printed on the stuff sack and interior mesh pockets. However, set-up is easy with the color-coded SR tent and fly buckle attachment. There are 7000 series aluminum alloy poles and aluminum reinforced stakes. With Mountainsmith’s design, you can easily take a trip to the great outdoors confidently and comfortably. This 2 Person 3-4 Season Lightweight Backpacking Tent by WolfWise is a lightweight and portable backpack tent that includes a USB LED lit roof. The roof has a rechargeable light strand, which ensures you can always see in the dark. The tent is set-up in minutes and can be used as a waterproof shelter in a variety of environments. The tent is made of anti-tear 109T embossed polyester fabric. It has ventilating mesh with double stitched and taped seams. The floor is waterproof and can resist even the pouring rain. There are aviation grade aluminum poles to provide durable and strong structural support. The shock corded poles are easy to set up following the provided instructions. There are eight stakes and rope included to secure the tent down in case there is wind. The entrance is covered from the rain and provided easy entry and exit from the inside. With WolfWise, you can be sure you won’t regret your purchase. This Bryce Ultralight Tent and Footprint by Paria Outdoor Products is made of 40 dernier rip-stop SilNylon and a 20 dernier rip-stop SilNylon rainfly. This is the lightest backpacking tent coming in at just 3 pounds and 7 ounces. This tent is fully featured. It has two-way inner and outer zippers, mesh pockets, back vents, a pole repair splint, 12 Y stakes, Dyneema guylines, taped seams, and 5000mm silicon/PU waterproofing. This is a high-end ultralight backpacking tent that will give you the flexibility to travel anywhere. There is a footprint and fly included in the purchase to add protection to you and your tent. The materials are high-quality and will ensure that your tent is durable and will last for countless adventures. You won’t break your back travelling with this tent because it is a great weight-saving alternative. The rainfly has a vestibule incorporated in the design to cover the main entrance. You can easy store small gear or shoes in this space and still keep them dry and protected. The rainfly can be added or taken off. If it is taken off, the inner layer is made of mesh, so if it’s a clear night you can see the stars. Paria Outdoor Products wants you to buy with confidence and they stand behind their products with a limited lifetime warranty. You already know that learning how to plan a backpacking trip and using a backpacking checklist to pack all your great is important. You likely have backpacking food and lunch ideas, but you should also focus on sleeping tips for campers, so that you can comfortably cozy up in backpacking sleeping bags and rest your head on backpacking pillows, inside the safety of a backpacking tent. 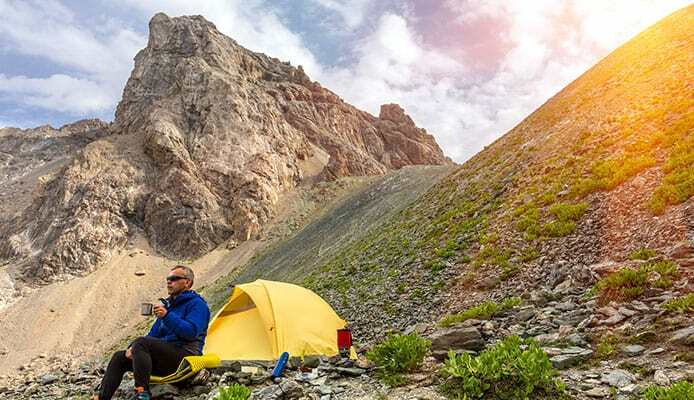 When it comes to choosing which backpacking tent is best for you, it is important to consider a few key features of a tent’s design. There are many different backpacking tent designs, and some may be better suited to your needs. There are elements to each design that can enhance your experience on your outdoor adventure. If you are backpacking in the rain or are following instructions for pitching a dry campsite in the rain, a durable design is what you need most. From the size to the style, these elements of the tent’s design can help you decide what you need for your camping adventure. Down to the specific details, here is our guide to help you choose the best backpacking design for you and your backpacking needs. The tent’s size when packed is an important aspect of the design because it tells you how much space you need in your pack to carry your tent. A tent’s size will usually be determined by its capacity. Single person tents are smaller than a two-person tent, and so forth. How many people you are backpacking with, will determine the size of tent you need, which in turn, will tell you how much space it will occupy once packed into your backpack. A good rule of thumb is that a single person tent should provide a range of 14-24 square feet of space and a two-person tent should provide a range of 26-35 square feet of space. If you are travelling in groups larger than four, it may be easier for each pair to divide and carry their own backpacking tent. This means there would be two tents in the group, instead of one large tent. Modern backpacking tent designs are usually extremely lightweight and compact due to the materials of which they are constructed. However, it is important to remember that a tent will have multiple parts that need to be packed. A tent’s fabric material, when packed, can be easily shoved into a backpack. If it is folded correctly, you can mold it into a manageable size. However, you tent may also come with a separate rainfly, ground cloth, poles, and stakes. All of these parts will need to be packed to enable you to set up your tent at the campsite. Altogether, a tent may take up a lot of space in one pack. If you aren’t travelling solo, it is easier to divide the tent among people’s packs, so everyone can help carry the weight. A backpacking tent’s size when open will determine how much space you have for people once the tent is constructed. Again, this will be determined by how many people you are travelling with. You want to be certain that you have enough space inside the tent for the people in the group and all your gear. After all, it won’t be helpful to you if you are dry but all your clothes and sleeping bag are wet. The tent you choose should have enough floor space, as well a vertical space. Many tents are quite spacious inside and you should have the height to be able to stand partially upright. The best backpacking tent will provide you with adequate space for you to feel comfortable, while still keeping the tent compact enough to travel around. Remember that the larger the tent is inside, means the larger the tent will be to carry. As always, larger tents will have more weight and bulk, which will be added to your pack. However, the reason backpacking tents are great is because they make spacious designs compact enough to be carried for miles on the trails. Backpacking tents should come in a range from less expensive to more expensive. You can find tents for under $100 and over $500. However, you should always be able to find a high-quality design that is still affordable. One way to determine how much you should invest in a backpacking tent is to consider how often you will use it and in what conditions. If you are going to be using your tent often and in harsh conditions, it may be best that you truly invest in a high-quality backpacking tent. This could mean spending $500+ on a tent, but it would ensure that your tent is durable enough to withstand the frequent use and wear. As well, if you find yourself always going on backpacking trips, the lighter the material is the more expensive it gets. Material that is both lightweight and durable make the cost of tents go up. One of the most expensive materials that is ultralight but durable is SilNylon. SilNylon is an extremely durable, waterproof, and sturdy material. It is great for campers who want to invest in a tent because they will use it frequently. Ultralight tents will also make it easier to carry all your gear, without being too overwhelmed by weight. There are many budget and expensive backpacking tents and you shouldn’t choose a backpacking tent based off just those words. Some campers may think that they can get away with a budget tent but find that it isn’t holding up on their trip. Other campers may think that they need an expensive tent, but in reality, they could get by without such a large investment in a tent because they don’t use it frequently. The weight of a tent is an important aspect for packing because it can help determine how much you can comfortably carry in your pack. Every person is different, and some can carry more pack weight than others. If you are backpacking solo, a tent’s weight can really affect what you pack for your trip. A tent is essential to your trip but finding the correct size and weight would be extremely important. A tent’s weight will be determined by the size of a tent. A single person tent will weigh less than a two-person tent. Therefore, it is important that your tent capacity matches the number of people in your group to ensure that you aren’t carrying unnecessary weight. Most backpacking tents will state they are lightweight based on the materials used, which is most like nylon or polyester. Both materials are lightweight and durable. The best backpacking tent design will have extremely lightweight tent stakes and tent poles, which could be made of titanium. When it comes to space in your pack, every ounce can count, so if you find yourself out on the trails often it’s better to invest in a high-quality backpacking tent that can save you a few extra ounces of space. One way to help with carrying the weight of your tent is to split the pieces between people. If you are backpacking with three people, each person can carry a different part of the tent on the trail. The tent body and fly can be carried separate, as well as the stakes and poles. This separation can help ease the burden of everyone’s pack. The amount of time it takes to pitch a tent can greatly affect your efficiency on the trail. If there is inclement bad weather coming in, you want to have a tent that is easy and fast to set up. Nothing is worse than being stuck out in the cold or the rain. It’s also important that all your gear stays dry because wet gear can put you at risk. The best backpacking tents will be fast to set up and come with clear directions. You don’t want to scramble and struggle with the set-up instructions on the trail either. You should feel confident that you can successfully set up your tent in the time it states on the product. Most top rated tents for backpacking can be set up in a couple minutes. On the flip side, you also want your tent to be easily broken down. It would be frustrating to have a tent design that is easy to set-up, but impossible to pack back down. You have to be able to take your tent down in a reasonable time too. The best backpacking tent designs will ensure that their tent is easily broken down too. After all, you don’t want to be stranded and wasting time trying to figure out how to fold your tent back into your pack. You should also be sure that your tent matches your group size because you may not be able to set up a two-person tent if you are travelling solo. You must ensure that you can confidently pitch your tent before you leave on your trip, or you could be stranded without a shelter. Every camper knows that in many locations in the world, there are four seasons. The first location that many people think of when camping is the mountains. Mountains certainly experience all four seasons. Therefore, it is important that you consider what seasons you want to camp in. Out of spring, summer, fall, and winter, many campers will only camp in the summertime. Tents that are built for the summer season, normally can only handle the weather into the very beginning of fall. This means that a summer tent is a 1-2 season tent. If you are wanting to camp in the winter time, you need a 3-4 season tent. Most backpackers hike extreme trails on their trip, so having a 3-4 season tent would be best. Even in summer, higher altitudes can always have unexpected weather that may be cold. A 3-4 season tent will provide the protection you need to ensure you have a shelter, no matter where the trail takes you. As well, 3-4 season tents tend to be thicker and more durable to handle bad weather. If you are absolutely certain you won’t be dealing with extreme altitude and only camping in summer, you may be able to invest in only a 1-2 season tent. By matching the correct season of your tent to the trip you are taking, you can save yourself money. 3-4 season tents are more expensive than 1-2 season tents. If you are looking for a tent, but want to stay on a budget, it’s best to choose exactly what you need. You would be wasting money is you buy a 3-4 season tent, but you only choose to camp in the summertime. Or, you could think that a 1-2 season tent will due for your trip, but in reality you should have invested in a 3-4 season tent. It is very important that a camper’s tent functions for their trip. After all, a tent’s job is to function as a temporary shelter. If your tent fails to properly function on the trail, it can lead to stress and a disaster. You should be sure that you have matched your tent’s advertised functionality to your trip. If you are going out in winter, you need a 3-4 season tent. If you are backpacking with two people, you don’t want to bring a four-person tent. If you are able to find the best tent match for you and your trip, the tent you choose should function without fail. The tent’s functionality will be best if you match a tent’s design to your specific needs. The more closely you can match what you want to use the tent for with the actual tent design, the better the tent’s function will serve you. You want a functioning tent. That is extremely important. Therefore, take the extra time to really look for design features you know you will use and will function for you and your group. All tents need to be durable and strong, but some need to take it to an extra level to ensure you have a reliable and safe temporary shelter on your trip. Tents that are 1-2 season are durable enough to handle rain and wind. Tents that are 3-4 season are durable enough to handle rain, wind, and light snow. It is important that you match the season of the tent to the season of your trip because it can give you advantages to extending the durability and strength. However, you also want to invest in a tent that is made of high-quality materials. You don’t want a tent where the zippers leak. By investing in the best backpacking tent, you are sure to find a tent that holds up throughout years of use when it is properly maintained. The durability and strength of the tent means that you will have a tent to use for numerous trips and throughout the years. There are many different materials that are used in a backpacking tent design. Generally, a fabric’s dernier indicates the strength of the yarn. A lower dernier fabric usually indicates a lightweight backpacking tent. Tent’s with a higher dernier fabric tend to be heavier and therefore, more durable. As well, the dernier of a fabric can vary between the tent floor, canopy, and rainfly. The three most common fabrics used for backpack tents are Polyurethane (PU) coated fabrics, SilNylon, and Dyneema. Polyurethane (PU) coated fabrics are the least expensive way to invest in a waterproof fabric. However, they are prone to disintegration over time. Specifically, hydrolysis is a chemical process that is known for causing the breakdown of the material. If you don’t want to put a huge investment in a tent and you don’t use the tent extremely often, Polyurethane coated fabrics could be a great choice for you. SilNylon is a nylon that has been coated in silicone elastomer. SilNylon is becoming more common in high-quality backpacking tents. SilNylon is a popular choice because it is lighter, stronger, and more durable than the Polyurethane (PU) coated fabrics. Many tents that are made of SilNylon have the material on the outside, but on the inside, it is the Polyurethane (PU) coated fabric, so that it can be seam-sealed by hand. However, SilNylon tends to stretch a lot, which can warp the overall shape. SilNylon is normally more expensive and has a higher pricetag than the Polyurethane (PU) coated tents. Dyneema used to be called Cuben Fiber. Dyneema is the strongest, lightest, and most waterproof fabric available on the market. Unlike SilNylon, Dyneema does not stretch. The material tends to hold its shape better, which is an advantage when it is wet because you won’t have to readjust the guylines as frequently. As well, Dyneema can be easily repaired with tape. It weighs less than half the weight of SilNylon and gives obvious advantages to backpacking tents. The major drawback is that it is an expensive material. If you are backpacking all the time, Dyneema could be worth the major investment. No matter the material of your tent, you want to be sure that it will hold up to the job. When it comes to relying on a temporary shelter, cheaper is not better. Just keep in mind that you don’t always have to go for the most expensive option either. There are many other affordable options that still make a great tent that will provide function and protection to you while you are on the trail. There are a lot of different things that can occur on the trail. From weather to animals, you want protection from it all. The tent’s main function is to provide you with protection when spending time in the great outdoors. A backpack tent needs to be able to withstand wind, rain, and possibly light snow. Depending on your trip and the destination, you may need to invest in durable 3-4 season tents. You should also understand water resistant and waterproof and what’s the difference, so you find a suitable tent for the weather elements. You shouldn’t invest in a tent just because it has the cheapest price tag. When it comes to your protection, you should find a tent in your budget that will deliver the best protection for your trip. The interior space of a tent is how much space the occupants and their gear will have inside once the tent is constructed. You want to ensure that you have plenty of space, not only for people, but for your gear as well. It won’t help if you stay dry, but all your warm clothes get wet. The interior space of a tent should comfortable hold the occupants, their backpacks, and space to lay out the sleeping bags. The general rule of thumb is that one person needs 14-24 square feet of space to be comfortable. You should keep in mind that the rainfly can add a bit of storage space too. If the rainfly has a vestibule built into the design, you can store your gear in that space, without losing sleeping space for the occupants. A vestibule is great because it keeps the gear dry and protected from the elements but is outside the main body of the tent. This means that the inside sleeping space of the tent can be reserved for just the essential gear like sleeping bags and sleeping pads, as well as the occupants. The capacity will be dependent on how many people you are bringing with you on your trip. There are many different tent sizes from common 4 person tents to some that are 10 person tents, though those are rare for backpacking. However, when you are backpacking, space is precious. Every ounce you can save on weight can help ease the burden of your pack. You should make sure that your tent holds the number of people you want, with their gear and no more. Don’t use a four-person tent if you are just camping in a pair because you are simply wasting space in your pack. You want a tent that fits the capacity of your group exactly because that can give you the ability to carry a few extra tools or cans of food. One tip, which may help save on weight, is to carry two tents. If you are backpacking in a group of four, it may be too hard for one person to carry the tent body of a four-person tent. Instead, the group could bring two tents. One tent for each pair. Each pair can then split the pieces of the tent to help each other carry the weight and leave space for other gear in their packs. For example, one person can carry the tent body, but the other person can carry the rainfly. Then you can also split the stakes and poles between people. By dividing the tent, you are saving weight and helping each other carry the burden. There is an endless variety of different types of tents. From canvas tents to teepee tents and learning to use a guide to freestanding tents, or specific season tents like summer tents, you have plenty to choose form. One of the most common designs for lightweight backpacking tents is the dome. Dome backpacking tents are extremely popular because they are simple, easy to assemble, and provide plenty of space inside once they are constructed. A dome tent has poles that arc from side to side and the tent walls are hung in-between. A rainfly can be easily added to the outside to provide protection from rain or light snow. Even dome tents have different designs. Some are freestanding and will need ropes and guylines to support the structure, and others aren’t. The dome tent’s rounded shape makes then sturdier in higher winds, if they are properly staked down. The dome makes the tent aerodynamic as well, which means that it won’t be blown over if the direction of the wind suddenly changes in the night. 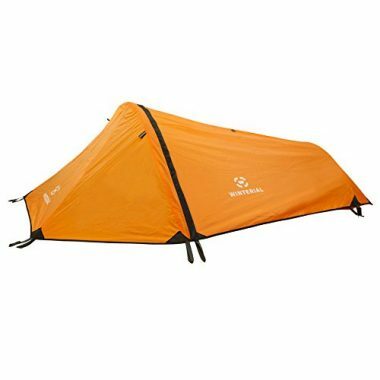 There are other shapes available in backpacking tents too, but they aren’t as popular or are specialized. One specialized shape is a geodesic shape, which is essentially a large dome tent. The larger the dome, the more support it needs. Geodesic shaped tents use more poles that crisscross to create a stronger structure. These tents are an excellent choice for winter tents because they are stronger and better with wind resistance. One shape that is not common in backpacking tent designs is a tunnel tent. Tunnel tents use 2-3 U-shaped poles to make a tunnel. The tunnel shape needs to be staked down to hold its shape and stand up. These tents are not as popular because they are not great with wind resistance. Due to the shape, the tunnel is prone to being knocked over in the wind. Therefore, these tents will be best set-up with natural cover like a hill, to provide a windbreak for the structure. Another shape that is less common is an A-frame tent. A-frame tents have a pole at either end, which the tarp is placed over to make the A shape. A-frame tents can shed snow well, but they are also prone to being knocked over by the wind, like a tunnel tent. The dome tent is the best shape because of its versatility and availability. You will find that the majority of the tent designs on the market these days are the dome shape. With the dome tent you are getting a secure and stable design that can be easily set-up and dismantled. Dome tents offer spacious interiors and keep you warm. Plus, dome tents are still extremely compact and easy to carry on the trails. Another aspect of the design of a tent is the wall construction. There are normally two different styles of wall construction. Tents are commonly classified as singled wall or double wall. The most common choice for campers to choose is a double walled tent. A double wall tent has an inner layer, often made of mesh and solid fabric sections with a waterproof bottom. The outer layer, called a rainfly, is optional and can be added to the structure. A double wall tent is popular because it allows for ventilation, which prevents the buildup on condensation, but can be used with more variety. For example, on a warm summer night, you might want to forgo the use of the rainfly, so you can see the stars. A single wall tent is made of one waterproof layer that have vents to help the tent breath. Double wall tents are the most common and popular choice. Campers enjoy the ability to choose whether they would like to use the rainfly or not, if it is a clear night. The rainfly can also be set-up without the inner wall layer, which could save you weight, depending on the conditions of your trip. Double wall tents are also, normally, less expensive than single wall tents. Another advantage is that double wall tents have excellent ventilation because the first layer is normally made of mostly mesh. Condensation is an enemy when on the trail. Heat that builds up inside the tent can then make water build up on the inside of the tent, which can easily drip through the mesh onto you. A double wall tent has the ventilation to keep you warm, but also keep the tent from building up too much heat that it begins to sprinkle rain inside. Every tent will have a door, but there are different designs with tent doors that you may prefer over others. Many tent doors are a large D-shaped door or a large rectangular shape. Most dome tents will have a D-shaped door that follows the shape of the dome. Some tents will have two doors, which means that each person can have their own entrance, if needed. Most campers who are in a smaller group choose to use one door as the primary door, if there is more than one. The rainfly will often have a space that covers the door, which provides an area to keep your shoes that is outside the main body of the tent, but still kept dry form the rain. This mini awning is popular but is different from some tent designs. Smaller tents normally have a door that unzips directly into the main interior space, however some tents may have an added vestibule. A vestibule is like a mini room that is attached to the main body of the tent. The vestibule may be completely sealed from the inner main section of the tent, or it may simply be attached without an inner door. A vestibule is a great space for you to keep your gear and your shoes, without taking up sleeping space. The vestibule will be the main door of your tent and once you pass the small space, it will open up to the main space of the tent inside. However, as stated above and by a guide on tent vestibules, they are built into the rainfly design. This means that the ground will be gravel, but the top is covered by your rainfly. This will add weight and bulk to the rainfly, but it can be extremely helpful. Tents that have a vestibule in the rainfly may have one for each door. If you have a two-door tent, there may be two vestibules in the rainfly, with one for each door. You should remember that a vestibule will add more bulk and weight to your tent but can be important parts of a tent. If you want to give space for a tent with a vestibule, you may need to cut back on other gear. However, vestibules can be a great space for you to store gear without losing sleeping space. If you want the added protected storage, it may be extremely helpful for you to make room for a design that has an added vestibule, just because the benefit of more gear storage is appealing to you. Door and vestibules can also help you learn how to keep your tent cool on summer trips by provided maximum airflow throughout the inside of the tent body. You may be wondering what is a tent footprint? The footprint is also called a ground cloth. It is a piece of fabric which matches the size and shape of the bottom of your tent. A footprint can help keep your tent from flooding in rainy conditions. As well, a footprint keeps your tent cleaner for longer use. A tent floor can easily get punctured by a small rock and a footprint can add a layer of protection. The footprint on most tents is highly suggested because of the extra layer of protection it provides. A footprint can help save your tent in heavy rain. If your tent floor isn’t durable enough to keep out all the water, adding a footprint as a layer can really reduce the amount of water that may leak through the bottom. If you want to take really great care of your tent to ensure multiple uses throughout the years, a footprint is an excellent accessory that can be added to your tent’s gear. Q: What is the difference between a backpacking and camping tent? A: The main different that distinguishes backpacking tents from camping tents is the weight. A backpacking tent will most likely always be lightweight or ultra-lightweight because it will be carried long distances on a person’s back. A camping tent tends to be heavier because it is often carried short distances and is not packed into a backpacking backpack. Backpacking tents are often more durable than a camping tent, because they may be exposed to a wider variety of weather. Backpacking tents are also double wall and most camping tents are single wall. The main difference is that with the purchase of a backpacking tent you will get the durability and strength of a tent in a lightweight design. Everything in a backpacking tent’s design from the tent body to the poles and stakes, will be made of lightweight material. Therefore, backpacking tents are normally more compact in their design. The best backpacking tent will be easily folded down to a manageable size, so that it can be easily packed into a backpack. As well, most backpacking tents have the option of coming in 1-2 or 3-4 seasons. This means the tent is rated for use throughout half or all of the four seasons. Depending on when you backpack, you may need a 3-4 season tent’s durability for your trip. Overall, the reason that backpacking tents are chosen is because they provide an edge that normal camping tents don’t. Backpacking tents save space in a backpack, so it can be carried miles on the trails, but also provides an extremely durable and safe temporary shelter. Almost all campers who are not car camping will choose to invest in a backpacker’s tent because they have such useful and functioning designs. Q: How do I clean my backpacking tent? A: This will be heavily dependent on the tent’s individual design. Tent’s cannot be washed as one solid piece and they definitely should never be placed in a washing machine. The best way to clean your tent is to spot clean after every use for stains. Always shake off any extra dirt or rocks. You don’t want to fold and store your tent full of debris because that can add wear and tear to the fabric, which means your tent will be damaged and possibly unusable, on the subsequent trip. Most tents can be easily cleaned with a mild soap and warm water. It is extremely important that after any time your wet a spot or dampen your tent, you allow it to fully dry out. A moist environment is bad for a tent in storage because it can lead to mold and rot. Your tent should always be stored bone dry. As well, most companies will provide a user’s manual or guide with their product. The user’s manual or guide will most likely include cleaning instructions or suggestions. The user’s manual or guide is the best place to get information because it will be catered specifically to the type of material used in the tent design. You should always start with the manufacturer’s information as a suggestion before you begin cleaning your tent. To keep your tent in top shape, you will want to ensure that it is cleaned after each use. Trails are dirty and there are small rocks or gravel that can attach themselves to the tent floor and walls. You don’t want to pack away a dirty tent because it can make the tent disintegrate faster. If you clean your tent after every use, allow it to fully dry, and pack it correctly then, the tent should last you for years. As well, it ensures that you aren’t frustrated with a dirty tent, when you pull it out on the trail. It’s nice to have a clean temporary shelter every time. Also keep in mind that you should have a backpacking repair kit checklist, so if you run into any problems on the trail, you aren’t stuck with a hole in your tent. A clean tent that is managed and repaired when needed, will last you longer and provide better protection. Q: What is the ideal weight for a backpacking tent? 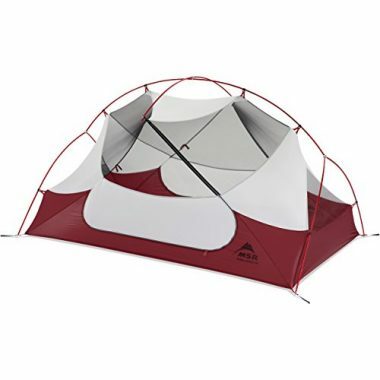 A: A top rated tent for backpacking will always be lightweight or ultra-lightweight. With backpacking, it’s all about carrying your gear with you on your back. That means that you have limited space and need to pack your gear accordingly. There isn’t a specific ideal weight for a tent, but you should find one that you know you can manage with all your gear. Lighter tents are smaller and will have less space inside. Larger tents will have more weight and be more spacious. A 3-4 season tent will be the heaviest to pack because they are made of thicker material that is sturdier and more durable. You should always feel comfortable carrying your tent, which is why you should match your tent to your specific needs. The better you match a tent, the better chance you have at finding a design that you are confident with using. Backpacking tents are specifically designed to be carried hundreds of miles. To compress your tent even further into backpacking backpacks, you can invest in compression sacks to help manage the bulk. However, most backpacking tent designs are fairly compact. This means that everything included in the tent from the body to the stakes are listed to be about 5-6 pounds. There are numerous tents that range in the 4-5-pound range and the lightest weight available is just under 4 pounds. It is entirely up to you to decide what weight you can manage carrying in your pack. No matter the tent design, backpacking tents are designed to shed several pounds of weight off what a normal tent might weight. This means by choosing a backpacking tent, you are already at an advantage with saving weight and space in your backpacking backpack. No matter which backpacking tent design you choose, finding the best backpacking tent is important. A tent should ensure that you feel safe and comfortable when you are using it on the backwoods trails. A backpacking tent should feel manageable to use, set-up, and carry. There are many different designs and sizes available, and you will easily have a wide variety of tents to choose from. The best backpacking tent will ensure that you, the members of your group, and your gear will stay dry and protected throughout the duration of your trip and if you so choose, throughout all four seasons. The best backpacking tent will suit your needs and have you comfortable on the move with your portable and temporary shelter. If you know exactly what you need, you can save time and money by investing in a top rated tent for backpacking. Before you now it, you’ll be off hiking all the off the beaten track trails! Do you own one of the backpacking tents that made it onto our list? Let us know how it has worked for you in the comments section below.